Don’t let a Big Oil crony take over the Department of Energy. Jews with and against Trump. An inevitable brand. In the name of National Unity and Healing. Just an Illusion? Don’t let Rick Perry turn the Department of Energy into the Department of Oil. Give $15 to Friends of the Earth and your gift will be matched dollar-for-dollar! Donald Trump nominated Rick Perry to head the Energy Department. This is an emergency. Perry is a climate denier and Big Oil crony who once vowed to abolish the very agency he’s been tapped to lead. Perry only cares about helping out his Big Polluter friends. If confirmed, he’d have the power to gut wind and solar programs and massively expand fossil fuel production. He’d turn the Department of Energy into the Department of Oil. Help block Rick Perry from leading the Energy Department: Give $15 to Friends of the Earth. Your gift will be matched dollar-for-dollar! Rick Perry was governor of Texas until 2015. He used that position to champion fossil fuel production. He wrote that climate science is a “contrived phony mess” and accused climate scientists of manipulating data to get money. He has fought the regulation of greenhouse gas emissions because of the “devastating implications” for the energy industry. And he opposes truly clean energy like wind and solar. It’s no secret why Perry has been so hostile to the Energy Department. After all, he’s received more than $13 million from Big Polluters. As head of the Energy Department, Perry would have a lot of power to roll back our progress. He has lots of friends in the fossil fuel industry. They stand to make big money off of polluting our planet. And Perry wants to make it easy for them — no matter what the cost to people or the environment. But at Friends of the Earth, we have a plan to fight back. Perry has to be confirmed by the Senate. We can push key Senators to stand up and stop this nomination. But we need your help. Don’t let Trump give control of the Energy Department to one of Big Oil’s cronies! Give $15 to Friends of the Earth today! Trump’s choices to run the government show how far he’ll go to keep Big Oil happy. It’s not just Rick Perry. He selected Exxon CEO Rex Tillerson to head the State Department. Scott Pruitt, his pick for EPA Administrator, is suing the EPA to roll back its environmental rules. And his top environmental advisor is climate denier Myron Ebell. At Friends of the Earth, we’re working to expose and defeat Trump’s terrible appointees. So we’ll shine a light on their shady corporate pasts and push Congress to reject them. And if they make it through Congress, we will expose and watchdog their every move. Friends of the Earth was made for this fight. By making a donation today, you’ll help build the strong movement we need to stand up for people and the planet every time they’re under threat. Help expose and defeat Trump’s terrible appointees like Perry! Give $15 to Friends of the Earth and your gift will be matched dollar-for-dollar — up to $350,000. Protecting the president-elect and his family. Sign the petition of The NYC Mayor. As New Yorkers, you know by now that we have a pretty unprecedented situation happening in our city — a president-elect living and working in the middle of Midtown Manhattan, at one of the busiest intersections in America. The NYPD takes their role protecting the president-elect and his family very seriously, and they have done a tremendous job. But I do not believe New York City residents should have to pick up the tab for that work. Last week I wrote a letter to President Obama and Congress asking for a $35 million reimbursement for the period between November 8 and January 20. Since then, Congress has approved 20 percent of that amount. But that’s not enough. When the new Congress is sworn in, we are going to revisit this conversation and I think there is a good chance that we will do much better in the next round. But I want them to know that you are engaged on this issue as well. Sign my petition calling on Congress to provide New York City a full reimbursement for the cost incurred protecting the president-elect and his family. I also want all New Yorkers to know what a tremendous job the NYPD has done. They have taken on this unprecedented challenge and done a remarkable job — all while crime throughout the entire city has gone down 10 percent from the previous November. I know Congress and the president-elect understand the challenges being presented to the NYPD and to our city. I believe they’ll all do the right thing and reimburse our city soon. But it can only help if we all make our voices heard. Dakota Victory ! A message from Friends of the Earth. 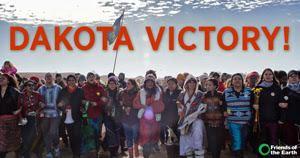 Click here to share the news about the victory at Standing Rock! Big news! The Obama administration just announced that it will not be granting the final easement for the Dakota Access Pipeline. This means Energy Transfer Partners — the company building the pipeline — will have to halt construction on the Standing Rock Sioux’s Treaty lands. This is a huge victory for the Standing Rock Sioux and the Water Protectors who have been fighting for months to protect their land and water from the risky project. And it happened thanks in part to people like you. You sent thousands of messages and phone calls to President Obama to stand with the Standing Rock Sioux and other tribes. This announcement means the Obama administration will review the project’s environmental impacts. And it will explore alternative routes for the pipeline. But the victory is threatened by Donald Trump’s Presidency. Trump has already said he supports the pipeline. And he owns stock in the company that wants to build it. Indigenous peoples will build on this victory and keep fighting for their survival. So as we contemplate four years of a Trump administration, a few things are clear: we ALL have to keep fighting. And we have to show up for each other. Our country has been stoked by the flames of fear, bigotry, and division. Now, it’s time to come together and support the Standing Rock Sioux in their fight for justice.